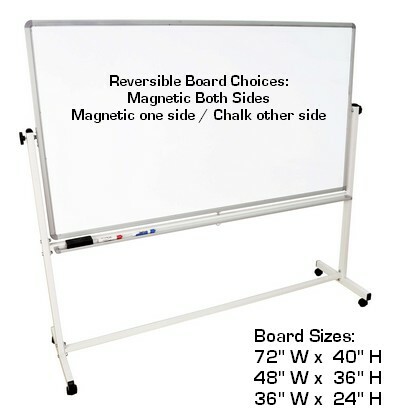 These high-quality whiteboards include reversible boards, meaning that you can use both sides. You can choose between Whiteboard on both sides, or Whiteboard on one side and Chalkboard on the other. It comes in 3 sizes. Luxor's Mobile White-Boards are ideal for meetings, teaching, presentations and more. Made from aluminum and wood they are light and easy to manuever. This portable whiteboard is reversible, double-sided white dry erase board. * Shipping: $153.00 Contiguous U.S.; Contact us for Canada and other locations. Using the drop down menu under the image, first the board size. Then, select either both whiteboard or whiteboard/chalk. The base price is for the largest size. When you select a smaller size, the drop down shows the discount with respect to the base price so as to meet its corresponding lower price.